Almost as easy to use as its name implies, the Kodak EasyShare software (free) provides consumer-level tools for organizing, sorting, editing, and using your photos in a variety of ways. Though it is designed specifically to work with Kodak cameras and printers (and is supplied with most Kodak hardware), anyone can download it at no cost and use it with any camera or printer. 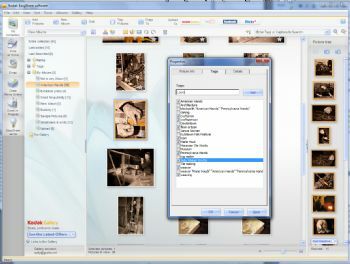 Adding keyword tags to your photos in Kodak EasyShare software is as simple as selecting your photo(s) and checking off all the tags that apply.